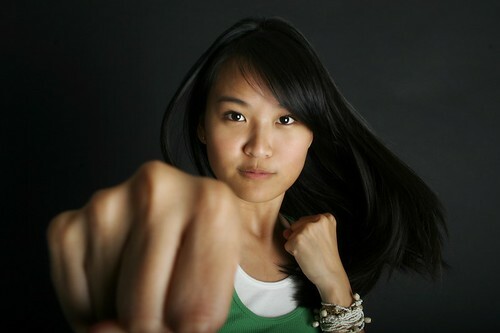 I had a great day of shooting with Annie Tsai of Annieisms in the studio and then in the mean streets of Orange. This shot took some time to get. Coordinating all the necessary elements was tough... we needed the fist to be in the right place in the frame, her hair to have a good amount of movement to it, her expression to be something fitting and her other hand to look like it belonged where it was. I did almost no post processing outside of cleaning up and adjusting curves, and I think the shot came out great.